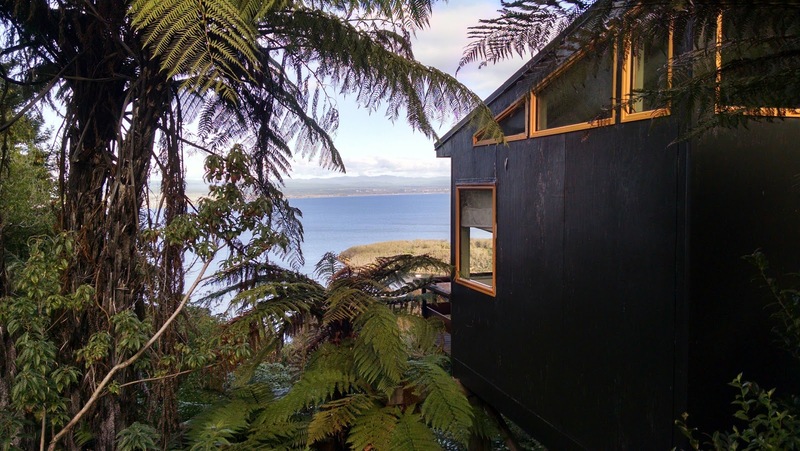 For our final, finale weekend in New Zealand, we drove down to Lake Taupo to lead a weekend-long retreat at the Tauhara Centre, which is something like a mini-Expanding Light that hosts all sorts of different spiritually oriented retreats on a beautiful hill overlooking the lake. But first we had to get there. We’d named our GPS on the first day of the trip: Georgia Sweet Potato. (She can’t spell, but she’s pretty good with directions.) So far, she’d been a great navigator, and we’d had no complaints. But she must have gotten some setting clicked for “obscure roads,” because we started taking some interesting turns. We were a little suspicious when we turned off the highway that actually said “Taupo,” but we were still on a highway, could still go 100kph, and didn’t think it could be all that bad. Then we turned off onto a smaller road that we figured would just take us to another highway. Then with each new turn we took, the roads got smaller and more winding until we were just bumping down a little dirt track with nothing around us but cows and scenery. But oh, what scenery. 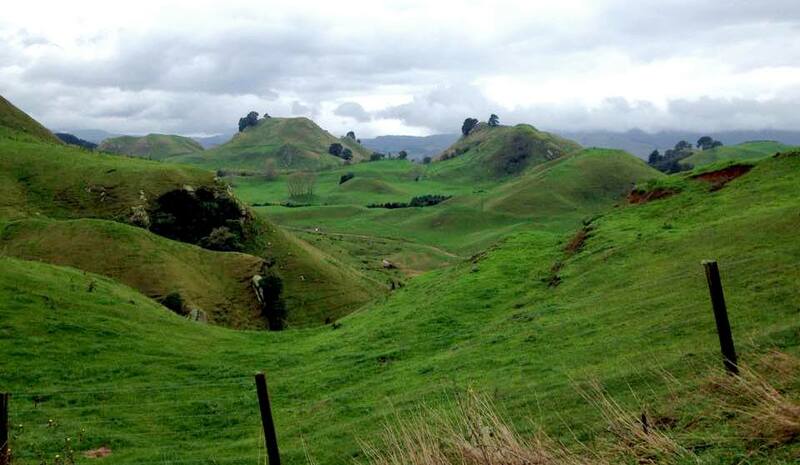 Beautiful green hills fresh from the rain, that at one point we simply had to stop the van to get out and look. So maybe Georgia knew what she was doing after all. Anyway, we made it to Taupo. We had about 35 people there for the retreat, which was a very nice size group for that facility. And somehow, the two days that we had there felt packed with a week’s worth of activities. (A lot will be getting posted on YouTube over the next few days as I get them processed.) 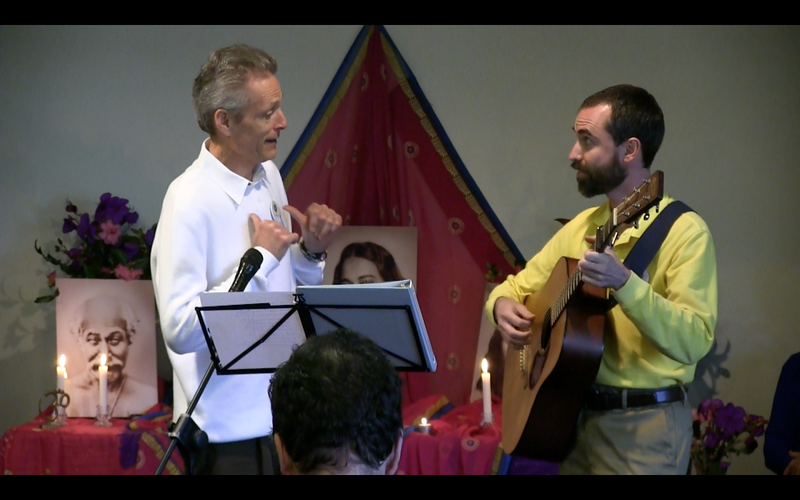 One of the most fun parts of it for me was the Saturday night concert with Dambara (here’s the video). I’ve had a delightful time accompanying him throughout this entire trip, and that evening was a very nice culmination of it all. 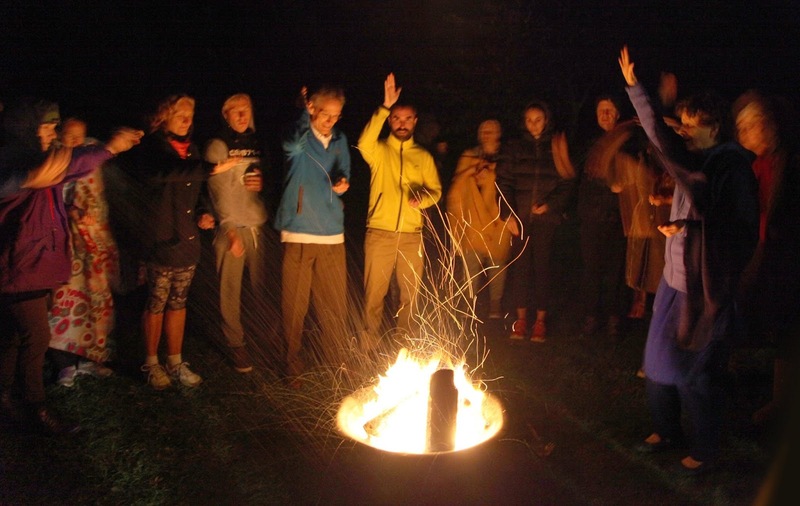 We started off with some fun, lively, laughing songs, and gradually moved more and more inward, which finally led us to an outdoor fire ceremony with a bonfire out under the stars. But we did make a quick stop off at Huka Falls. They’re not super high, but the water rushing through the ravine becomes such a beautiful shade of frothy, white turquoise that is absolutely stunning. The light was already fading, so the picture doesn’t quite capture it here. Today we’re lounging around back at Kavita’s in Hamilton, after dropping Travis off to head back to Australia. Then we’re heading home on Tuesday evening, to arrive 13 hours later on Tuesday afternoon (they refund you the day you lost getting here on the way back). Photos from the whole trip are here. Monday this week was a day off for us, so we drove to Wairere Falls, the highest waterfall in New Zealand’s North Island. It’s a beautiful hike, reminiscent of some California forests, but with extra, slightly tropical, touches. It’s quite steep, even resorting to stairs in a few places, and takes almost an hour and a half of pretty solid “tramping” (as they say here) to reach the top. So it’s very satisfying, both as physical exercise, and for the scenery. The first lookout point is halfway up, with a gorgeous view of the falls. When you reach the top, you can actually hardly see the falls themselves at all. A very placid river meanders right up to the cliff, and then heads so completely straight down that you can’t see where it lands, even from the little observation platform reaching out over it. The view of the surrounding countryside is stunning, though. The mountains end very suddenly, leaving completely flat plains over which you can see for miles. 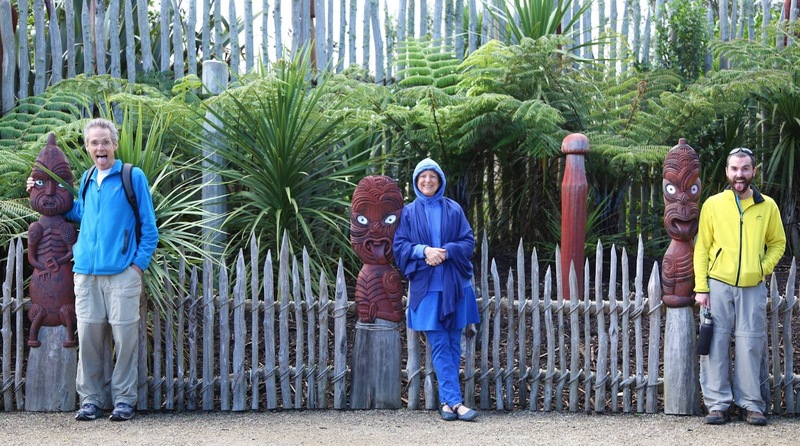 After a couple more days of workshops, we had some more free time today, so Dambara, Zebunnisa, Travis and I headed out for a trip to the Taitua Arboretum in Hamilton. The trees were nice enough, but as a tourist destination, it was underwhelming. The chickens were the most memorable part of it, in fact. Tons of them, just all over the place. There were times that we’d hear the crowing of roosters from all sides, as if a vicious pack of wild jungle chickens were slowly circling in for the kill. But we made it out safely. 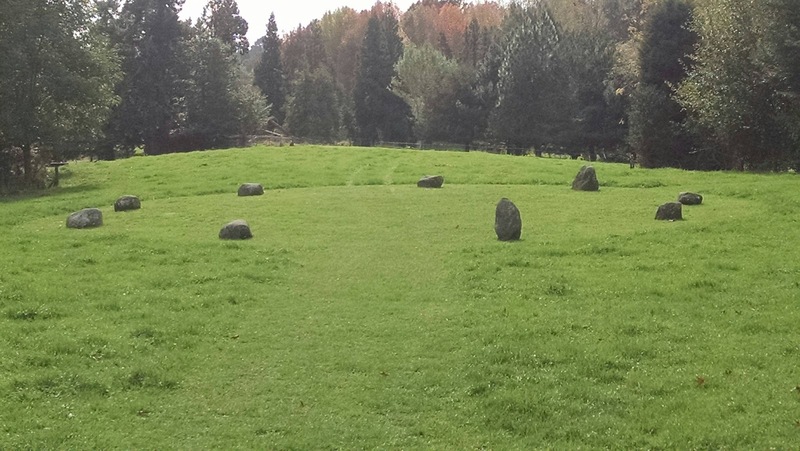 Also in the not-a-tree department, I was rather fond of this baby Stonehenge they have. A few thousand years more of regular watering and I’m sure it’ll be quite impressive. We had passed signs for the Hamilton Zoo on the way to the arboretum, so we decided to head there next. It’s really quite a nice little zoo, with hardly any people there on a gray Thursday afternoon. We managed to catch feeding time for the lemurs and spider monkeys, which was fun to watch. A lot of the larger animals (tigers, cheetahs, etc.) were being lazy and unentertaining, but the rhinos put on a pretty good show. One of them had a really good wallow in a mud puddle, then started going after her companion like she wanted to push her in as well. 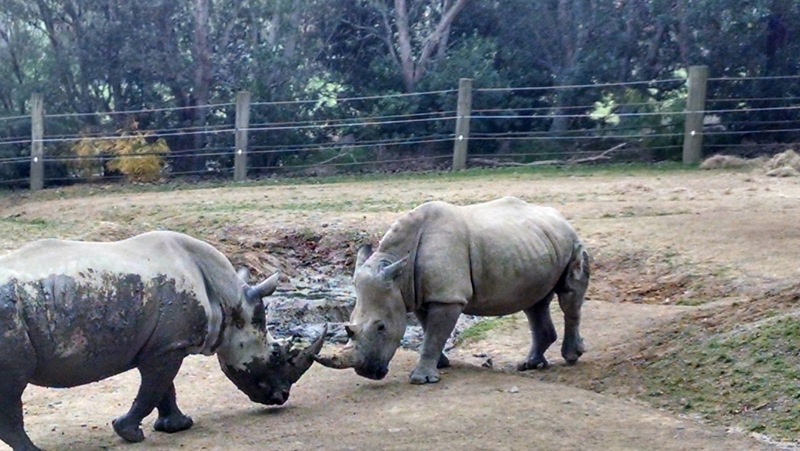 Then they both took a fun canter around their whole enclosure. Lots more activity than I’d have expected from them, and very impressive to watch such formidable beasts in motion. 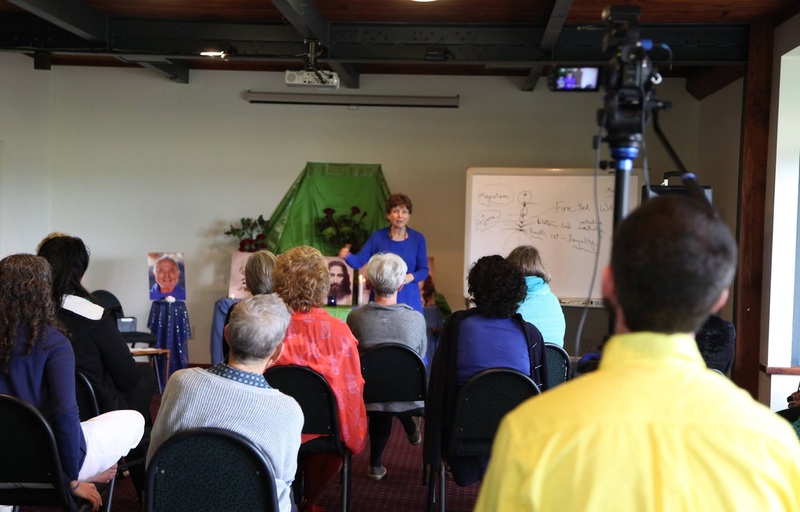 We’ve finished up our workshops in Hamilton, and tomorrow we’re heading out to Lake Taupo for a weekend-long retreat program. Then that’ll wrap things up for the trip and we’ll be heading home on Tuesday. I’m continuing to add photos to the album here as I go. 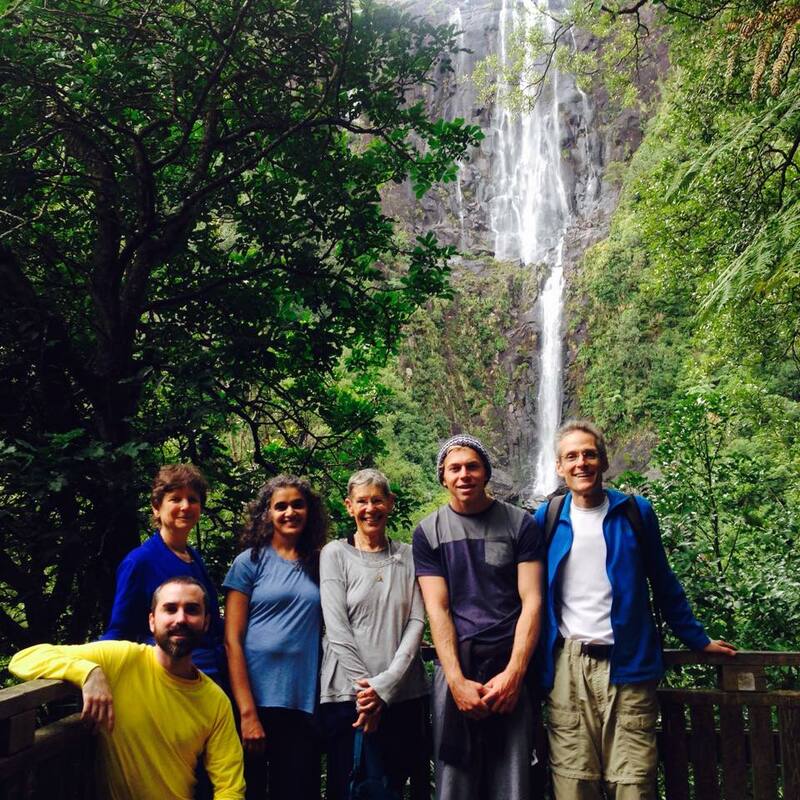 Well, I’ve been in New Zealand now for about nine days, so it’s about time I wrote something. If you want to skip right to the photos, here they are. For those of you who don’t know the situation, this is sort of a working vacation, but in a very fun way. 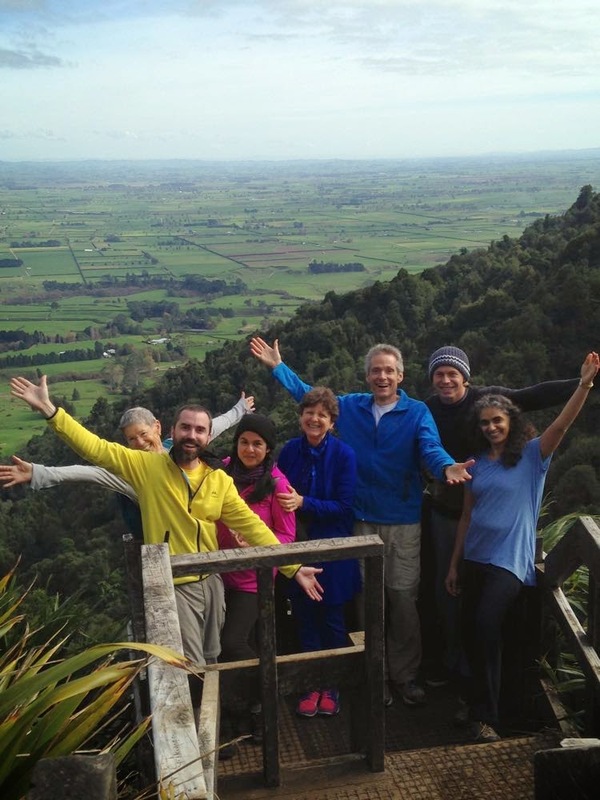 I’m part of a small team going along with Asha for a series of programs, retreats and classes she’s giving, mostly around Hamilton, though we go to Lake Taupo for the final weekend. The role that I officially got signed up for was that of cameraman (I’m posting everything on YouTube as we go). But I also get to be guitar accompanist to Dambara, who’s our main music guy. Oh, and I get to learn to drive on the left side of the road, which isn’t so bad in and of itself, though getting used to the roundabouts is more of a challenge. 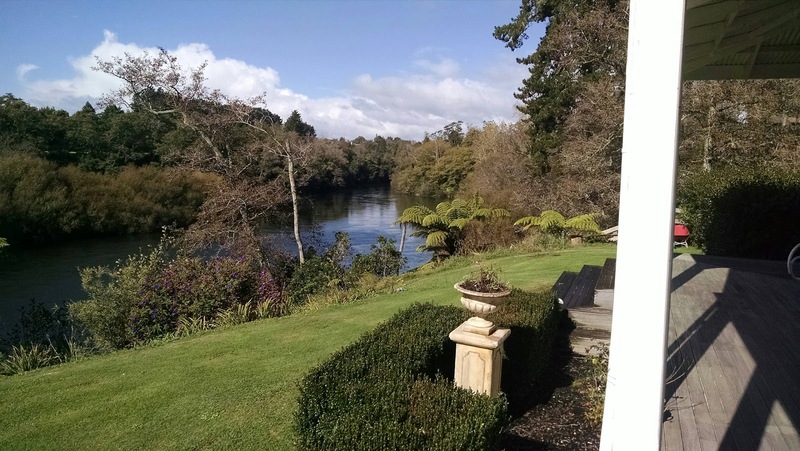 The four of us (Atmajyoti rounds out our crew) are staying at Kavita’s home, aka the Narrows Retreat, on the Waikato River. This picture does no justice to the beautiful view from the porch. Also staying here we have Zebunnisa, a Canadian who met Kavita through a work exchange program and has become her right-hand gal, and Travis, a devotee visiting from Australia. And oh, hey, Kavita’s husband and two daughters are actually still trying to live here in their own home, and being awfully good sports about it all. Veda and Devya have been making us fantastic desserts (like white chocolate cheesecake) in spite of getting shuffled around to sleep in the office or the corridor or whatever makes sense on any given day. So it’s a pretty big, fun, happy family we’ve got here. We had Thursday and Friday off, so we took the opportunity to play tourist a bit. Our first excursion was to Hamilton Gardens, which is a world-famous collection of different themed gardens. Even off its prime in the fall, it’s delightful. That’s us next to some carved statues in the Maori garden there on the left. I also quite liked the celestial turtle dragon thing in the Chinese garden. The next day we visited the nearby Zealong Tea Estate. And yes, that excellent name is exactly what it looks like: New Zealand Oolong. We got to go on a little tour, see the tea plants, learn about how it’s made, and sample several teas in a tea ceremony. I do quite like tea anyway, but it was really something to so carefully and deliberately sample such high quality, precisely prepared teas. 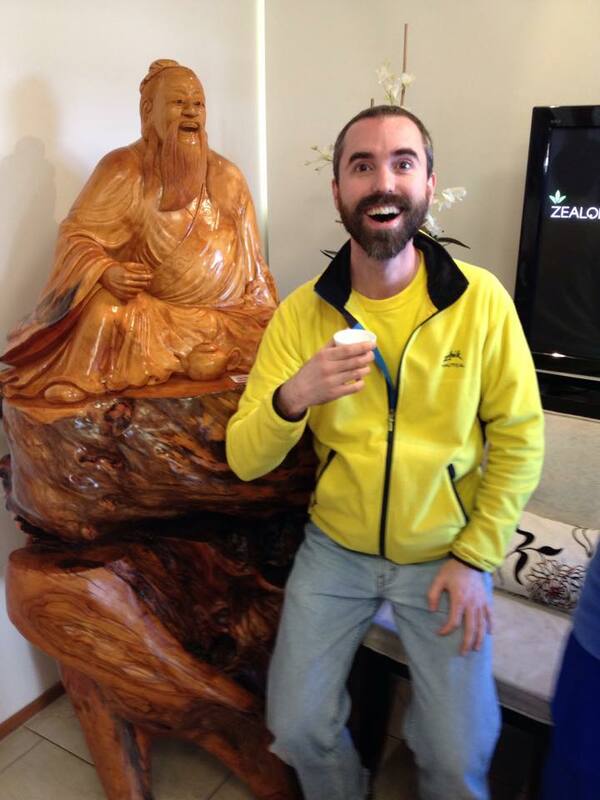 This is me here with a statue of a happy, tea drinking monk. Making two of us. In the midst of all this, I’ve also been finishing up National Poetry Writing Month. The poem-a-day thing was pretty crazy trying to keep up with while traveling, but somehow I managed (though some of them were the results more of sheer stubbornness than actual art). You can read the results, if you’re into that kind of thing. We have another busy weekend ahead of us starting tomorrow, so that’s all the updates for now. I’ll keep adding occasional photos to the album here until the next post.